Jhapan festival is observed on the last day in the Shraban month (July – August) in Bengali calendar and is dedicated to the snake Goddess Manasa. It is a sort of continuation of the Nag Panchami festival observed a few weeks earlier. Jhapan is today mainly noted for the live display of Nagas or snakes in Bishnupur or Vishnupur, which is around 200 km west from Kolkata. In its true sense, Jhapan is a form of Nature Worship. Jhapan is observed mainly in the western parts of West Bengal and is largely of tribal origin. 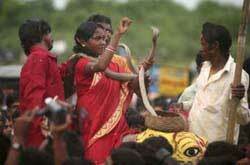 Goddess Manasa or Manasha, the snake goddess, is worshipped throughout the region. 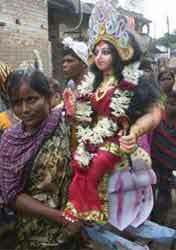 Special idol of Goddess Manasa is made and on the festival day it is carried around the villages. There are several folk tales dedicated to Goddess Manasa and most of them extol of the need for man to live in harmony with nature. The day is of great significance for snake chambers in the region and they display their snakes on the day. Some even show their affection by kissing it. Jhapan festival is highly anticipated by photographers. Photos of tribal people handling live snakes and kissing it are published on the day after the festival in major newspapers around the world. Notoriously, missing from the pictures is the cultural and traditional aspect of the festival which is deeply rooted in Nature. Most photographs are primarily meant to create shock and awe among people who have no idea about the tribal culture and nature worship in Hindu religion.